Flying Blind, LLC and Code Factory Solutions at the 2008 NFB Convention! You are invited to a Code Factory demonstration of GPS and Reading On-the-Go applications for the blind and visually impaired! Join Flying Blind, LLC as it represents Code Factory solutions at the National Federation of the Blind 2008 Summer Convention! 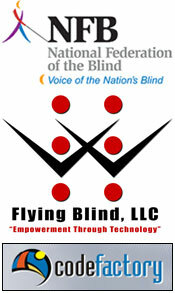 Flying Blind, LLC is pleased to be demonstrating the latest innovations of Code Factory, the global leader in making mobile phones and PDAs accessible to persons who are blind and visually impaired, by participating in a variety of activities at this Summer’s National Federation of the Blind Convention, which is to be held at the Hilton Anatole Hotel (http://www1.hilton.com/en_US/hi/hotel/DFWANHH-Hilton-Anatole-Texas/index.do), June 29th - July 5th, 2008. We cordially invite you to attend three formal presentations on Monday, June 30th, 2008 which will be conducted in the Travertine Room, Atrium Mezzanine. These presentations will demonstrate Code Factory’s latest accessible solutions, enabling blind and visually impaired users to explore the world and read on-the-go using their mobile phones. We are very proud to announce the upcoming release of Mobile Geo, the first GPS navigation application for Windows Mobile-based Smartphones and Pocket PCs, which has been developed in partnership with Sendero Group. We are also pleased to announce the upcoming release of Mobile Daisy Player V2.0, Code Factory’s highly-anticipated digital book reader for mobile phones and PDAs. These presentations will be hosted by Larry Lewis, President of Flying Blind, LLC, a long-time user of, and ambassador for, Code Factory products. 1:00 PM - 2:00 PM: "Debuting Accessible GPS Solutions"
2:00 PM - 3:00 PM: "Reading On-the-Go using Accessible Mobile Phones"
4:00 PM - 5:00 PM: Repeat of "Debuting Accessible GPS solutions"
We are delighted to announce that staff from Sendero Group will co-present the sessions showcasing Mobile Geo, Code Factory’s GPS application powered by GPS and mapping technology from Sendero. The Sendero group is the leading provider of GPS products for the blind. Also joining us, Jim Fruchterman, President of Benetech, and founder of www.bookshare.org, will be paying us a visit during our "Reading On-the-Go" session. Last, but by no means least, Daniel Hubbell, Technical Evangelist from Microsoft’s Accessibility Group, will be participating in these sessions discussing Code Factory’s and Microsoft’s partnership to bring portable access to hundreds of its hand-held solutions. In addition, Mr. Larry Lewis, on behalf of Code Factory, will be conducting one drawing per session. Each drawing will give all participants a chance to win Mobile Geo + Mobile Speak Smartphone or Pocket and Mobile Daisy Player + Mobile Speak for Symbian Phones. We would be delighted if you could join us for one or both of these sessions. Each session has a limited capacity, and will be filled on a "first come, first serve" basis. For more information about these sessions, please e-mail Larry.Lewis@Flying-Blind.com or phone +1 (216) 381-8107. These solutions will also be demonstrated in both the Sendero Group and Optelec booths in the Exhibit Hall where Mr. Larry Lewis will be available to answer questions and walk you through a demonstration of one of the Mobilespeak screen reading applications, as well as Mobilespeak’s unparalleled Braille support using a wireless refreshable Braille terminal. We look forward to visiting with you in Dallas. Until then, safe travels!